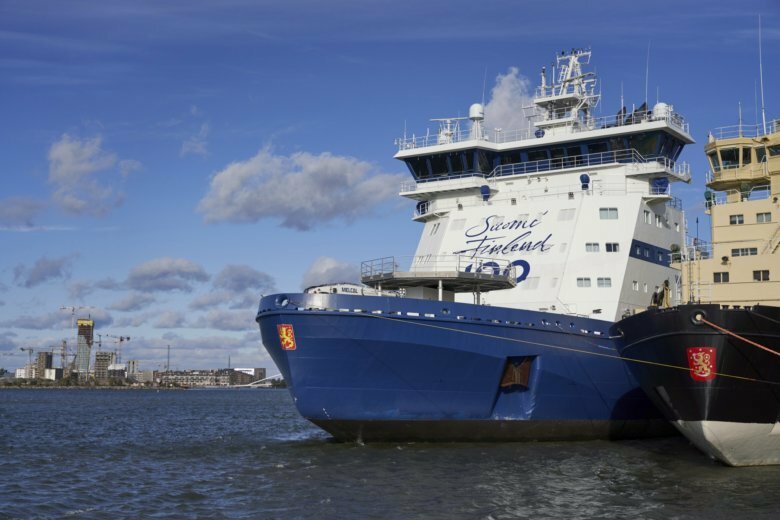 HELSINKI (AP) — A Finnish icebreaker has conducted an oil spill response exercise in the Baltic Sea, testing a new, inbuilt oil recovery system — a first for an icebreaker. The vessel, Polaris, can collect 1,400 cubic meters (49,000 cubic feet) of oil, even in harsh and icy weather conditions. The Polaris operates mainly in the Baltic but can also reach large parts of the Arctic Ocean during the summer months. The highly automated system opens hatches on each side of the vessel from which inflatable oil containment booms are deployed. With the vessel positioned in the path of an oil spill, these booms can trap pollutants, pushing them into hull of the ship. A skimmer with brushes then separates seawater from the oil, which is stored in large tanks. Polaris’ icebreaking capabilities means the vessel can intervene in oil spills in icy waters, but the cold brings another set of problems: oil gets thicker at colder temperatures. So the system is heated, to allow the pumping of oil with very high viscosity. The Gulf of Finland has some of the densest maritime traffic in Europe, with Russian oil flowing westwards and container and passenger traffic sailing between Helsinki and Estonia. The ship’s operator, Arctia Ltd., a Finnish government-owned enterprise, hopes Baltic expertise in both icebreaking and oil spill response can inform and educate decisions made much further north. Shipping is increasingly venturing into the Arctic — for tourism, trade and in search of untapped deposits of minerals and fossil fuels — therefore the potential for oil spills from platforms and vessels operating in remote locations is a major cause for concern among environmentalists since the 1989 Exxon Valdez disaster off Alaska killed a quarter of a million seabirds, as well as hundreds of seals and sea otters. In September, Russian President Vladimir Putin announced plans to increase traffic on the Northern sea route connecting Asia to Europe via the Arctic from 10 million tons today to 80 million tons in less than 10 years. Operating in the Arctic ocean remains challenging and dangerous. Vessels face high risks of running aground in waters which are still poorly charted, and while thick ice may be retreating, ice floes still present a serious threat to shipping. Environmental group WWF warns that oil spill response capabilities in the Arctic remain very limited and no comprehensive assessment of the risks has been conducted.